Management Professor Ethan Burris will spend three months at Google this summer as a faculty-in-residence for their People & Innovation Lab (PiLab), a part of their People Analytics group. Dr. Burris will be designing and executing research projects related to managing employee voice – ideas and feedback given by employees. He will also be working with Google to create interventions such as policies, trainings and workshops based on the data received from his research. Google’s People Analytics group employs a number of scientists collecting data from Google employees in an effort to base HR decisions on actual employee data. Dr. Burris is only the second faculty-in-residence ever in the People Analytics group for Google. The appointment will be the first time he has been able to focus solely on a single research project since graduate school and he is really looking forward to taking a break from juggling his many faculty priorities here at UT and focusing on research for a set amount of time. The specifics of the research Burris will be conducting are yet to be determined, but will focus around his work on employee voice. 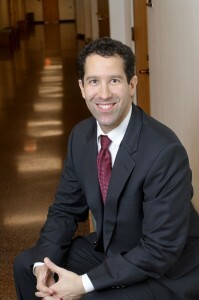 His research on the topic has been featured in The Wall Street Journal and Harvard Business Review. Employees at Google have a more active voice than those at many other companies and one area Burris will be researching is why Google employees feel more empowered to speak up so the company doesn’t lose that culture as they continue to grow. He will also be looking into whether there are pockets of employees they don’t hear from. After he compiles and reviews the research, he will be serving in a consulting role, helping them determine how to act on the feedback they receive and what new practices they might adopt. Burris looks forward to publishing his research and sharing more about the experience with future students in his class. BHP Senior Rachel Solomon was a student in Burris’s Organizational Behavior class and thinks his experiences at Google will be a great supplement to the curriculum. “The BHP case-based curriculum is so valuable because it shows us how to apply the somewhat abstract theories we learn in class to the working world. But when a professor incorporates his or her own experience with a company, it is even more motivating and engaging because we can ask them more specific and in-depth questions,” she said. This entry was posted in News, Program News and tagged Employee voice, Ethan Burris, Google, PiLab. Bookmark the permalink.